So I had the opportunity to hit off one of these systems again the other day and brought my TM with me. Unfortunately, the balls they had plus the ones I brought were not marked for the HD system and this the analysis I was hoping to do was not possible. I did take measurements, but because spin was not getting measured on the HD I don’t want to report my findings too much other than to say both systems seemed relatively consistent with each other. One thing I did notice was how well my TM measured short chips. I measured one right down to 3 yards. I think TM has really improved their software on these shorter chips on the 3e. As as a summary, I had fun playing Banff Springs on the HD, it seemed to be pretty consistent with my TM. One odd thing I noticed was that with on centre hits with my driver, the HD unit was never able to give me a club head speed reading. We just pulled the trigger on the widescreen version of HD. I did a boatload of research and was between fullswing and HD them picked HD because I liked how they were a one stop shop. They do not use a bunch of third parties for software etc and use a professional workstation with Linux. I would love to hear about any other recent installs. Ours gets intallled here in about 2 weeks. Congrats on that - I have the marketing materials from HD Golf and they are incredible looking systems. Just curious how your setup went, and if you may have any photos of your installation? Does HD Golf oversee the installation as well, and are the HD software updates included with the purchase, and for how long? I would really like to see if you noticed any lag, as one of the primary detractors from TGC for me is the lag (delay) from hitting the ball to seeing it appear on the screen... That's always been a turn-off for me and I've played on many different sims, just not on an HD Golf one, which I really would like to try. You can see updated videos and pics below. I can say I am very happy with out new HD Golf Sim. Very accurate. Very reliable. Easy to use. I think they have this perfected and are releasing updates consistently. The built in swing analysis is fantastic. If you have a golf pro or coach they will be blown away how well this system works for coaching. Wow! Amazing how quick the ball flight is picked up... You're right, as a computer/software professional for 30 years, a Linux workstation is always going to outperform Windows. Just incredible. I've been told there is a demo location I could try out near Chicago. How does the short game/putting/chipping react on the screen? Also, curious about the mat they install as it looks like it includes rough, and sand simulation too? Are those accurate as well? That only leaves one 'little thing', your lie is always perfect, never uneven and for this I've heard you can purchase a motorized platform to simulate with, though would guess that would be quite an investment. Here are a few shots of the quality of the sim setup. Thanks! The system really is a performer. It was built for a commercial environment and I am a true believer it is optimal to have a Linux workstation vs PC running windows. You do not need to do anything with software setup, worrying about load times, etc. If you check out the 240fps GoPro video above it shows how fast the response it, the ball touches the screen and boom it picks it up and you see it immediately continue. Funny part is I am just a customer but love supporting them because they deserve the success and will pour it into further advancements just like they already have. The support team deserves a shout out as well, any questions on using the system and they are on point. Beautiful, thanks again for posting pics... I noticed quite a lot of darker photos, so guess the lighting requirements are very specific for the cameras to pick ball flight up and create the stunning course images! Are the courses animated, is there weather conditions and do you have multiple tee boxes in HD Golf? How many 'no read' shots do you get, out of 100? No problem, glad to help. The chipping and putting is the same, instant and very accurate. I use the practice mode for chipping often. It puts you at various holes anywhere from like 20 yards to 100 yards out and you just fire away approach shots from the same spot. Your lie is what you make it, I compare it to the range. You are working on your swing, ball strike, balance etc. A moving platform almost just makes it unrealistic in my opinion. When is the last time you you had a perfectly flat incline? I really thing sometimes sims are overthought. It will never be real golf. I wanted a sim that ensured me the best data for each shot and yes playing the courses is great and fun but each shot is favored of course from the lie etc but still amazing practice just as if you had a nice lie on the course. They are experimenting with wind and other factors from what I was told but measuring that instantaneously is no small task so they will not release anything like that unless it can actually be accomplished the right way. The do have a little animation on leaves, water, etc. As far as missing a shot, we have probably fired off thousands of balls by now and not 1 has bee missed. That might sound impossible, but I promise you it is true, trust me I was a little shocked. They have helped me with a few little setup and updates for little things but that was just initial setup and calibration. The dark sim room makes the screen clear and not washed out just like any movie theater but is not necessary. They have specific lights from above for lighting up the ball, club head, etc. The big light on the right in the video is the light for swing analysis video recording, I just put it on with the Gopro because gopro's struggle with low light video. Awesome comparison of Medinah real life vs HD golf. Looked and played the same! Impressive! Following his final-round 66 at the 2018 Shriners Hospitals for Children Open, Bryson DeChambeau talks about how an early season win changes his mind set for the rest of the year. After a few months with this is it still behaving well. Are there any on line tours or leagues? Ours has been fantastic. You get what you pay for. If you buy the sport version of Full swing it will perform like a low end model. The entry level of HD may be more but it is extremely accurate and that is what was most important to us. They have Online tournament there. 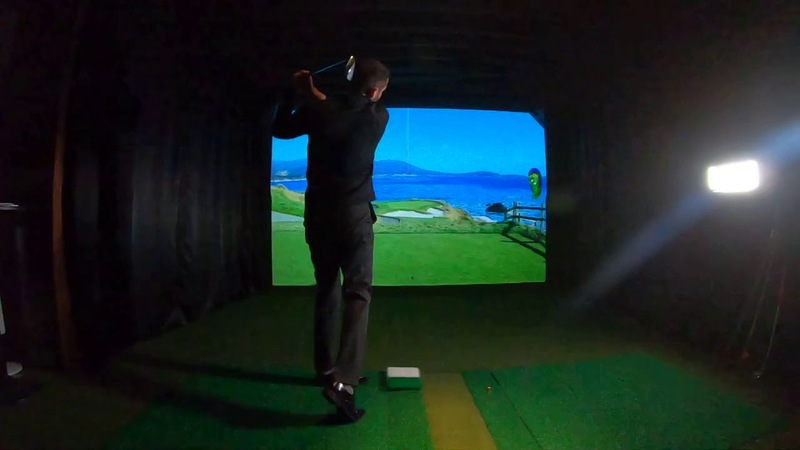 I have played in a couple at a local Golf Simulator place.